My Dad, born a Connecticut farm boy in 1922, was prime age for the service when the U.S. entered WWII. 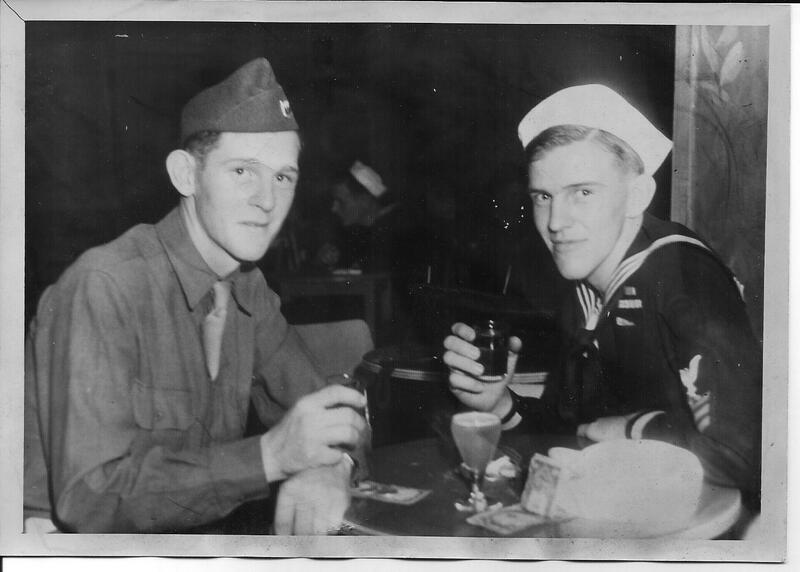 Always interested in radios and electronics, he joined the Navy in the fall of 1942 to train as a Sonar Operator. 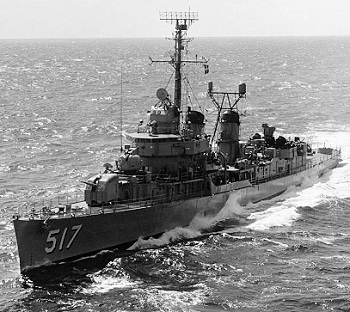 After training, he was assigned to the new USS Walker DD-517, a Fletcher-class destroyer headed for the Pacific. Although Dad and his future wife had met, romance had not yet bloomed. His letters to her were what finally turned her head and won her heart; she was corresponding with no less than three lonely boys far from home. Dad’s younger brother Ted was in the Army, and heard through the service grapevine that the Walker had been involved in the invasion of Iwo Jima and had suffered casualties. This letter was Dad’s response to a frantic letter from Ted, checking to see if he was okay. The letter is undated, probably written in April of 1945. “I was mighty surprised to hear that you had found out about our (the Walker’s) misfortune. No I didn’t write home about it so as not to worry anyone. We were cruising up and down one night about eleven thirty or so. Everything had been pretty quiet all day so we were a bit relaxed. About this time, the moon started to rise over the island and since everyone expected any trouble to start on the island side, that’s the only place we were watching. With a poor watch being kept on our port side, it gave a jap two man sub just the chance it needed to slip in. It was one of their newer ones and instead of having torpedoes, it had a solid head holding some half a ton of T.N.T. It was designed for a one way trip to join honorable ancestors. Well it made it. It hit us right in the magazine for number 1 gun. It was quite a nice explosion and it blew all of us on the bridge except the helmsman off into the water. I hit about two hundred yards away making a beautiful jackknife dive into the water. As I came up to the surface, I grabbed a salmon which happened to be swimming by and then lay comfortably on the surface in my little rubber boat watching the Walker on fire and eating the can of tuna fish. The great flames of the fire in our magazine were towering thousands of feet into the air and they soon attracted a squadron of Kamikaze planes. As they closed in on us, we threw up a murderous barrage of AA fire and only one succeeded in getting thru. He dove madly for the ship and hit her squarely midships, knocking out both engine rooms leaving us with no power at all. It also made another big hole in our bottom and we started to sink. The captain decided to try and beach the ship so the medical corpsman broke out their absorpant [sic] cotton and we jammed it into the hole to sop up the water. The machinist mates took a piece of iron pipe and an old peanut can for a piston and made an outboard motor which we hung over the stern and we started toward the beach at about fifty two knots. However our efforts were doomed and about fifty yards from the beach, the gallant Walker gave a last gurgle and sank. However, the water wasn’t very deep and we only sank till just the tops of the stacks were sticking out. The Seabees came over the next day and they decided we could save the ship. I forgot to tell you, the air around Iwo Jima has a lot of hydrogen in it. Well anyway, the Seabees brought over a bunch of bicycle pumps and all hands went to work pumping the hydrogen into the Walker. We worked about half the day and then the old ship started to rise. Boy did she come up fast. We got just a bit too much hydrogen in her and she came right up out of the water. Its lucky one of the Seabees was standing on the forecastle and when the ship was about 10 feet out of the water he released the anchor; holding her in place. Then the Seabees brought up a barge and welded new plates over our holes and we returned to service little the worse for wear. There were absolutely no casualties aboard the ship except me. I got pretty badly sunburned in my rowboat eating my fresh fried trout. No, I guess perhaps that sailor had a few too many drinks. We’ve never been near Iwo Jima. We were in the states when it was invaded and we’ve had no cause to go there since. Well, I’m tired from thinking up all that bulloney so I’ll quit now. Lets hear from you soon. You’re off to a great start, Pauline!